To improve existing simulation tools regarding the emitted airborne sound of internal combustion engines the emergence and the transmission of structure-borne sound inside the crank drive offers enormous potential. By using specifically designed in-situ measurement techniques, the Institute of Internal Combustion Engines and Automotive Engineering of the University of Stuttgart produced previously unavailable values which are used for an improved representation of dynamic processes inside the hydrodynamic bearings of a thermo-elasto hydrodynamic lubrication simulation model running at the Institute for Powertrain and Vehicle Technology, Machine Elements and Tribology of the University of Kassel. The research project piston conrod dynamic II (FVV project no. 1174) was performed by the Institute of Internal Combustion Engines and Automotive Enineering of the University of Stuttgart under the direction of Prof. Dr.-Ing. 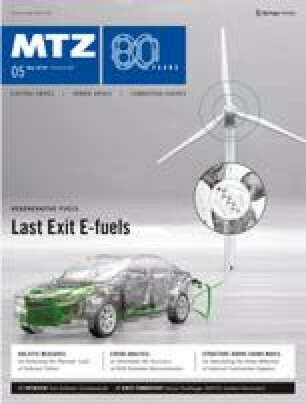 Michael Bargende and by the Institute for Powertrain and Automotive Engineering at the University of Kassel under the direction of Prof. Dr.-Ing. Adrian Rienäcker. It was established by the Federal Ministry of Economics and Energy (BMWi) via the AiF Arbeitsgemeinschaft industrieller Forschungsvereinigungen Otto von Guericke e. V. (IGF-Fördernr. 17983 N/1) on the basis of a resolution of the German Bundestag and was financially supported by an FVV working group under the leadership of Dr. H. Stoffels (Ford-Werke GmbH, Köln-Merkenich). The authors greatfully acknowledge the support received from the funding organizations, from the FVV (Research Association for Combustion Engines e. V.) and from all those involved in the project.